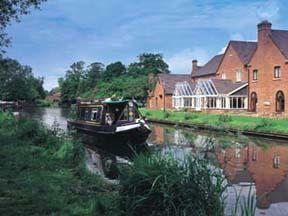 Choose from 60 hotels and guest houses in Staffordshire. Shown below a just a selection of the hotels available. To search within an area please use the menu on the right. This newly constructed, state-of-the-art hotel boasts contemporary rooms and extensive business facilities close to the M6. Re-charge at the fitness centre; relax in the lounge or bar; treat yourself at the restaurant or simply unwind in front of the LCD TV in your air conditioned, broadband-enabled room. The 12th-floor 'sky room' conference facility offers arresting 360? views and can host any occasion for up to 100 people. Alternatively, the Plas Des Legende can host events for up to 200 guests. The Moat House is the ideal quality venue for accommodation, conferences, eating out, functions and weddings. 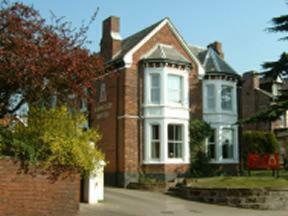 A warm and friendly welcome is assured in this four star, award winning, privately owned hotel in Staffordshire. The Moat House, Acton Trussell, with its 41 bedrooms, including 9 luxurious suites and flexible family rooms, is the ideal appointed hotel accommodation for relaxing in comfort. All rooms have private bathrooms, Freeview tv, hair dryer, Broadband, tea and coffee facilities, direct dial telephones, trouser press and most of them have air conditioning. The Moat House, Acton Trussell, Staffordshire has an award winning 2 aa Rosette restaurant, which has an idyllic location adjacent to the Staffordshire and Worcestershire Canal. Choose from our charming, traditional Lounge Bar or dine in the splendour of our Conservatory Restaurant, where all food is produced to order with the finest and freshest ingredients. Located in a spectacular canal side setting in the heart of rural Staffordshire, the Grade ii listed 15th Century moated manor house is close to Junction 13 of the m6 and to a wealth of countryside attractions including Alton Towers, Cadbury World, Shugborough Hall, The Potteries and Cannock Chase. Birmingham International, The nec and icc are also a short drive away. A modern hotel offering excellent facilities for business or pleasure, centrally located within the Midlands and close to Alton Towers, with excellent motorway and road links. The Best Western Stoke-on-Trent Moat House is located just off of the M6, ideally based for the city centre and just 25 minutes' drive from Alton Towers - maps provided. The hotel is perfectly located for nearby places of interest, including Trentham Gardens, Monkey Forest and Waterworld. Set on the Festival Park complex, there is a wide range of facilities for all of the family. Club Moativation Leisure features an air conditioned gym, an indoor heated swimming pool, a sauna, jacuzzi and steam room - great in which to unwind and relax. Set in 8 acres of beautiful gardens, yet only 2 miles from the A50 link road between the M1 and M6, this traditional country house hotel boasts superb views over the Peak District. Under 2 miles from the centre of Burton-upon-Trent, the hotel is within easy reach of a number of attractions, including Alton Towers, Drayton Manor, American Adventure, Chatsworth house, Tutbury Castle and Twycross Zoo. In the evenings, for a relaxing moment after a long day, you can enjoy your favourite tipple in the friendly atmosphere of the hotel's Club Bar before savouring local specialities, flavoured with home-grown herbs, in the oak-panelled Folly Restaurant. Situated in central Stoke-on-Trent, directly opposite the railway station and 16 miles from Alton Towers Theme Park, this convenient hotel offers free Wi-Fi in the public lounge, and on-site parking. The North Stafford Hotel boasts Jacobean-style architecture, with well-equipped en suite rooms and popular public areas. The on-site Six Towns Restaurant has buffet and carvery dinner options available to complement the lunch and breakfast selections. A special good-value Sunday carvery is also offered every week. Within an hour's drive of both Manchester and Birmingham airports, the hotel is also convenient for Stapeley Water Gardens and the Water World Indoor Tropical Aqua Park. Originally a country house, the Stone House Hotel has been tastefully restored in traditional style to provide a charming and serene environment. With beautiful gardens with an attractive patio area, guest facilities include an excellent restaurant with original fireplaces, lounge bar, indoor swimming pool, sauna and gym. Whether your visit is for business or leisure you will be sure of high quality service and a refreshing and friendly atmosphere at the Stone House Hotel. Slater's is country inn and hotel with en suite rooms, a bar serving traditional ales and home-cooked food, and a weekend restaurant. Slater's is 10 minutes' drive from the M6 (junction 15). Slater's has rooms with queen-size beds on the 1st floor, and rooms with twin beds on the ground floor. Each has a TV, tea/coffee, hairdryer, trouser press and ironing facilities. The restaurant at Slater's is open on Friday and Saturday evenings, and on Sunday lunchtimes. Meals are available in the bar at other times. Slater's Craft Village is a short stroll away, with shops and Curio's Tea Rooms. Slater's is 6 miles (9.5 km) from Newcastle-under-Lyme town centre and within 10 miles (16 km) of Stone, Market Drayton and the Potteries. The Britannia Stadium, home of Stoke City FC, is within driving distance. Providing good value, comfortable accommodation, Premier Inn Lichfield is situated 5 miles (8 km) away from the shops and restaurants of Lichfield city centre, with excellent access to the A38. Some of the comfortable rooms at Premier Inn can accommodate 2 adults and 2 children (under 16 years). The 2 children are also served a free full breakfast, when accompanied by an adult eating a full breakfast. The full all-you-can-eat breakfast includes cooked items, vegetarian options and a wide continental selection. 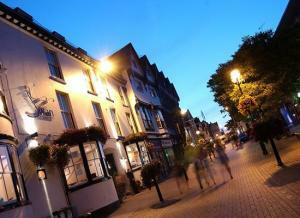 Premier Inn Lichfield is next to The Fradley Arms, serving good food in a welcoming environment. There is free on-site parking and a 24-hour reception at this Premier Inn. The Swan Hotel is a Quality Independent hotel located in the heart of Stafford Town Centre and has been lovingly restored. We have 31 quality bedrooms, including two four poster suites, which make full use of the history of the building. The hotel is fitted with all of the amenities that the business and leisure traveller expect, including broadband Internet and movies. Our four executive suites offer plasma screen TVs, DVDs, Freeview and air-conditioning. We also have rooms suitable for families, disabled travellers and some beautifully restored bedrooms that capture the history of the Swan of old. Guests won't need to leave the hotel to experience some of the finest food in Staffordshire. Our AA Rosette brasserie offers fine wines and superb service. This hotel is situated in the heart of the Potteries and is 18 miles from Alton Towers. The theatre, shopping centre, casinos, bars and restaurants are within walking distance. Quality Hotel Stoke-On-Trent is central to many popular locations including Trentham Gardens, Waterworld, Uttoxeter Races, Moorcroft Pottery. There is a free car park for guests. The hotel has restyled rooms and boasts a leisure club with swimming pool, spa, sauna, steam room, gym and sports-massage facility. Bennett's Bar shows live sports and has a pool table, while you can dine at Restaurant 66 and the Caf? Grand Bistro. Premier Inn Stafford North (Spitfire) has free parking, 24-hour reception, family-friendly rooms and excellent access to the M6 motorway Some of the comfortable rooms at Premier Inn can accommodate 2 adults and 2 children (under 16 years). The 2 children are also served a free full breakfast, when accompanied by an adult eating a full breakfast. The full all-you-can-eat breakfast includes cooked items, vegetarian options and a wide continental selection. Premier Inn Stafford North (Spitfire) is next to the Redhill Brewers Fayre restaurant, serving a traditional menu in a cosy environment. Friendly individual service in our independently owned motel coupled with excellent cuisine. Close to all major routes with 36 en-suite bedrooms. Whether you are looking for a weekend away or accommodation while on a business trip you can be sure your stay at The Plough Motel and restaurant will be enjoyable. The Express by Holiday Inn Burton-upon-Trent is situated on the A38, just south of Derby and the A50 spine road. The hotel is located in Centrum 100 Business Park. Alton Towers, Donnington Park Race Circuit, Uttoxeter Racecourse, Drayton Manor Park & Zoo, historic Lichfield and the Potteries are no more than 30 minutes' drive away. Surrounding cities include Derby, Nottingham, Stoke-on-Trent and Birmingham. Originally built in 1880 and retaining some of the elegance of the Victorian era, Haydon House has a friendly atmosphere, free parking, en suite rooms and an impressive restaurant. With a convenient location, Haydon House offers easy access to all areas of Newcastle-under-Lyme and Stoke-on-Trent, either by car or public transport. Free off-road parking is available for 40 vehicles. There are triple, double, twin and single rooms, all with mahogany furniture, TVs, radios and telephones with data ports. Each room has a luggage rack, a hairdryer and tea/coffee making facilities. The hotel has an elegant, yet friendly atmosphere and offers superb cuisine in the Townhouse Restaurant. The hotel also has a selection of function rooms for conferences, meetings, special occasions and weddings. 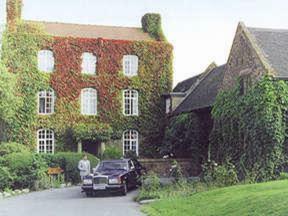 The Riverside Hotel is a country hotel, bar and restaurant, near the centre of Burton on Trent. It has its own private island, fishing rights and moorings, with views of surrounding countryside. The Riverside Hotel has comfortable lodge-style en suite bedrooms. The main building was originally a farmhouse. The Garden Room Restaurant and Riverside Terrace both offer seasonal modern and traditional British dishes. To drink, there are real ales, wines and speciality teas/coffees. The Riverside is ideal for exploring this area of natural beauty, or just lounging on the terrace and enjoying the view. Offering convenient, good value accommodation, Premier Inn Stafford (M6 Southbound) is close to local rail links, providing the ideal base from which to explore the area. Some of the comfortable rooms at Premier Inn can accommodate 2 adults and 2 children (under 16 years). 1 child is also served a free full breakfast, when accompanied by an adult eating a full breakfast. The full breakfast includes cooked items, vegetarian options and a wide continental selection. Premier Inn Stafford (M6 Southbound) is next to a Roadchef Costa, serving a range of meals and snacks in a comfortable environment. There is free on-site parking and a 24-hour reception at this Premier Inn. Set in a beautiful country garden, this distinctive hotel offers excellent food and good quality beds, and is convenient for East Midlands and Birmingham airports. North of Burton-On-Trent, just off the A38/A50, the charming Brookhouse is set in a quintessentially English village with thatched cottages and a flowing brook. The restaurant has a reputation for good food, and reserving a table is essential, especially at weekends. Soft lights and candlelight reflect in the silver and crystal, and fresh flowers are everywhere. Freshness is the order of the day, and your food is cooked to order. The wine list offers imaginative, rare and unusual wines. Bedrooms are splendidly appointed, but do ask to see the other bedrooms. You will find a remarkable collection of comfortable, gorgeously decorated antique beds. 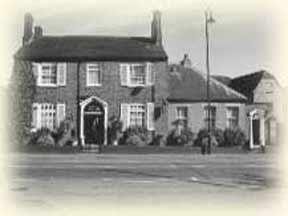 The Crown Hotel offers no-frills budget accommodation at realistic prices. It is easy driving distance from Stoke FC's Britannia Stadium and Alton Towers. The centre of Stoke is about a 10-minute drive away and The Crown is ideal for contractors working in the city. The hotel has easy access to the A500/A50, the M1 and the M6, and offers a warm welcome to all. The Crown Hotel is now under new management and has completed refurbishment of its exterior. Many of rooms have been redecorated and offer flat-screen TVs with Freeview channels. The restaurant/bar lounge offers bar snacks, steaks and daily specials and is open most days from 12:00 until 20:00 for food, and 23:00 for drinks. In the heart of Lichfield, just a short walk from the city centre and the magnificent cathedral, this charming hotel offers newly refurbished rooms with flat-screen TVs and free wireless internet access. Formerly the Little Barrow, the Cathedral Lodge Hotel has now refurbished all of the rooms to a very high standard. Each room has a flat-screen plasma TV with Sky channels and an en suite bathroom with a power shower over the bath. A limited number of non-smoking rooms are available. Free wireless internet is available in every room and in the hotel's bar area. There are excellent function and conference facilities, comfortable licensed bars and a superb restaurant. Friendly staff ensure that your stay is relaxing and comfortable. Free on-site parking is available for guests. An impressive Georgian property a short driving distance from Lichfield. 33 en suite rooms all with sky sport. Excellent facilities licensed bars conference facilities free parking and free wireless internet. A beautifully decorated function room can accommodate 250 guests. Civil weddings catered for. We offer an informal bar bistro or our restaurant with extensive menus. Free champagne breakfast at weekends. We pride ourselves on making guests feel comfortable and welcome. Built around a 17th-century farmhouse, the friendly Best Western Manor House has a swimming pool, Jacuzzi and plenty of traditional charm. 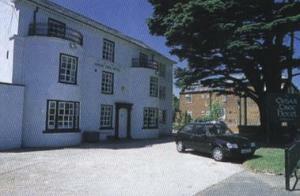 The hotel is 3 miles (4.8 km) from junction 16 of the M6, on the edge of Alsager. It is 7 miles (11.2 km) from Stoke on Trent and 6 miles (9.7 km) from Crewe train station. The award-winning Ostler Restaurant is set in the 17th century farmhouse and uses locally sourced ingredients. Stables Bar offers a relaxed setting for drinking and dining. Low ceilings and original oak beams provide a warm atmosphere. The George Hotel offers a warm welcome from friendly staff who aim to make your stay as comfortable and relaxed as possible. For business events and special occasions, the George Hotel offers a variety of rooms for up to 150 people for small dinner parties or large wedding receptions. The 16th century exterior of our Burton hotel hides a venue for personal service, modern meeting facilities and an excellent restaurant serving fresh local produce. The 38 rooms range from our well-equipped standard singles through to executive air conditioned doubles. Facilities include film channels, 24-hour room service, car washing (for midweek guests) and even a duck in the bathroom. 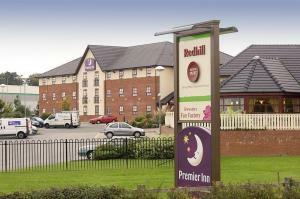 Premier Inn Tamworth Central is 1 mile from Tamworth Castle, Tamworth Train Station and local bus links. Leisure amenities are nearby, including a cinema and bowling centre. Some of the comfortable rooms at Premier Inn can accommodate 2 adults and 2 children (under 16 years). The 2 children are also served a free full breakfast, when accompanied by an adult eating a full breakfast. The full all-you-can-eat breakfast includes cooked items, vegetarian options and a wide continental selection. Premier Inn Tamworth Central is next to The Ladybridge Beefeater restaurant, serving chargrilled cuisine in a welcoming environment. There is a 24-hour reception and free parking at this Premier Inn. Drayton Court is a delightful Georgian country house hotel, personally managed by proprietors Raouf and Katie Bogue. If you're looking for a hotel that is informal with a 'home from home' atmosphere, then the Drayton Court is for you. 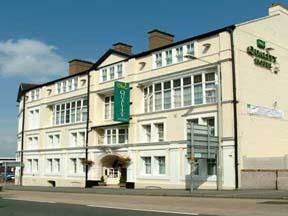 The Drayton Court Hotel is a warm and friendly hotel situated in the heart of the Midlands. A magnificent hand-carved four-poster bed is the highlight of the 20 individually interior designed rooms, many of which have exposed ceiling beams adding to the character of the building, a theme which begins as soon as you drive up to the car park which is accessed via a small courtyard. Please be aware that all of our bedrooms are located on the first or second floor and access is via a stairway, there is no lift available. The hotel has a fully licensed bar and a restaurant serving delicious food in a home from home atmosphere. Conference facilities are also available. 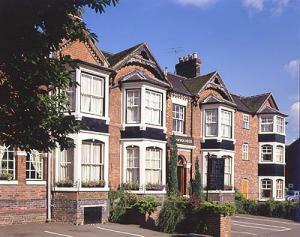 The hotel is located in a conservation area and is adjacent to Drayton Manor Park. An ideal base for visiting local attractions such as The Belfry Golf centre, Tamworth Snow Dome (real snow), local craft centres and Lichfield, as well as many other places of interest. This beautifully restored, Victorian hotel and coach house annex is situated within 5 minutes' walk of the town centre, on the best side of town. The hotel has a fully licensed bar, large double TV lounge, and is noted for its very friendly and homely atmosphere. A delicious freshly prepared breakfast is cooked to your taste when pre-ordered. Please note that when the hotel is not full, single rooms are upgraded to a double or twin room for the same price in the coach house. All the rooms are non-smoking. Just off the M6 Toll motorway, the hotel offers great value, with spacious, comfortable and modern en suite rooms and free parking. The Premier Inn Cannock (M6 Toll/T7) has a convenient location, within easy reach of the M6 Toll and the M6 motorway. The hotel has a 24-hour reception desk and some rooms can take 2 adults and up to 2 children (under 16 years). The 2 children also get a free full breakfast when accompanied by an adult eating a full breakfast. An all-you-can-eat breakfast buffet is available each morning and includes the expected cooked items such as scrambled, fried, poached or boiled eggs, and pork or vegetarian sausages. There is also a wide continental selection. The on-site Brewers Fayre restaurant offers traditional, great-value pub favourites in a family-friendly environment. The superb central location, close to junction 13 of the M6 (M6 Toll) and near Staffordshire's top attractions, makes this ideal for a stopover while driving through the Midlands. The hotel is less than 30 miles from the heart of the Midlands, Birmingham city centre and the National Exhibition Centre. For those on leisure breaks, it is near to Alton Towers (discounted tickets available from reception), the UK's largest theme park. 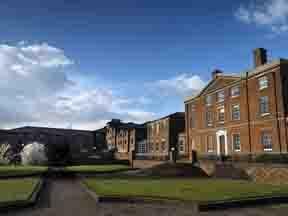 The famous Staffordshire potteries, Shugborough Estate and Weston Park are also close by. All the rooms are fully equipped to make your stay as comfortable and enjoyable as possible, with free tea/coffee making facilities available in every room. The hotel has 2 restaurants adjacent to the hotel and its pub includes the Whacky Warehouse where a special children's menu is available. In the Trentham Estate leisure development, within easy reach of junction 15 of the M6 motorway, this modern hotel offers free parking and comfortable, great-value rooms with power showers. The Premier Inn Stoke (Trentham Gardens) is just a few miles from the city centre. In the nearby Trentham Shopping Village, the Potters Wheel ride offers spectacular panoramic views of 740 acres of parkland. Some rooms can take 2 adults and up to 2 children (under 16 years). The 2 children also get a free full breakfast when accompanied by an adult eating a full breakfast. The full all-you-can-eat breakfast includes cooked items, vegetarian options and a wide continental selection. The on-site restaurant offers good food and drink at great-value prices.